Hey Valentine! 3 Tips to LOVE Your Body MORE this month! Wow, it's been a great week with such positive energy in the studio! To all our ladies doing the TransFIVE No Sugar Challenge, we are SO proud of you! You're almost done! Remember to take it one hour, one day at a time! Stay focused! YOU CAN FINISH STRONG! And... if you haven't done as well as you would have liked this week- SHAKE it OFF! Today is the DAY! You can always begin again. The time is NOW! Can you believe it's February?! January was like a "trial" month so let's say your 2018 starts TODAY! February is a month that can be focused on candy and sugary sweets for Valentine's Day! But, Valentine's Day is the perfect holiday to take extra time to show others how you love them and a time to take a moment to LOVE the body you have been given! Let's take some extra time to love our bodies, these beautiful gifts, in honor of Valentine's Day! The truth above is the Lord's thoughts about you! He has created you exactly as you are for a purpose. You are so beautiful and perfectly made in His sight! Take a few minutes today to write down things you love about the way God made you. Now, go share this verse with a friend or family member! Encourage your sweet friends today in their own beauty, inside and out. Valentines Day is the day of love! Let's be intentional about spreading love, encouragement, and blessings as much as we can. Now we know many of you will be spending Valentine's Day with your families so we wanted to share a few of our favorite healthier Valentine's Day recipes with you all! We guarantee these will satisfy your sweet tooth just as well as that box of Russell Stover- but without compromising your nutrition goals! These are treats (in moderation) you can feel good about because they will not only make your taste buds happy but make your body happy as well. First, here are our Top 3 Ways to Love the Body you have been gifted this Valentines Day! 1. Rest- Take the time to rest. Our bodies need rest! Take the time to sit and be still. Add in your quiet time to your day. Allow your mind time to rest, renew, and be refreshed. Lack of sleep can throw these processes off balance, and can to overeating. Getting enough sleep, seven to eight hours per night for adults is important for replenishing the body’s energy stores. So please relax, refresh, and renew! Rest is critical for living transformed! 2. Exercise- Add in exercise to your week! Your body and mind will feel renewed and alive when you honor it through a workout! View your time exercising as a form of worship! 3. Nutrition- Take the time to meal plan and prepare for your nutrition! Sit down and make a basic plan, so that you can hold yourself accountable and have an organized nutrition plan! 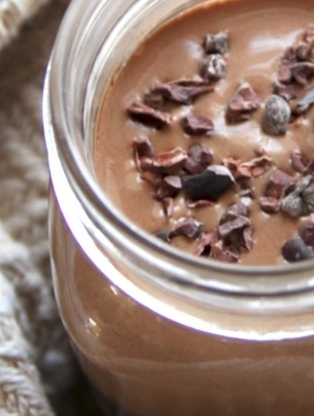 If you are craving chocolate, here is a great recipe from our TransFIVE Meal Plan that will help fix that craving without added sugar! Try these healthy deserts after TransFIVE! Pulse ice cubes in blender to crush. Add almond milk, banana, cocoa, and other ingredients and blend until frothy. Serve immediately and enjoy some liquid energy! The Chia seed helps keep the smoothie dense and satisfying, all while helping to increase your energy and endurance; promote your hydration and electrolyte balance; lower your blood pressure; regulate your blood sugar levels; and support your weight loss by keeping you feeling full longer. Ladies, we hope that you take the time to love your body! Your body is a gift and a temple! You are made in His image. Let's finish this week strong and feel accomplished after completing TransFIVE! If you didn't join us for our no sugar challenge this week, it's not too late to join! You can purchase the eBook on our website HERE! Don't forget about our February calendar challenge either! Commit to doing everything with your WHOLE HEART and getting active every day this month! You can do it! You can find recipes, workouts, and videos on our website! Use these as a resource for your meal planning and workouts outside of the studio! You can find them under the HEALTHY LIVING TAB! GET YOUR VALENTINE'S DAY GIFTS HERE! Check Out Our February Client Spotlight Kathy Cousart! Feel Inspired to LOVE your body! Are You Up For the Challenge?! FREE 5 day No Sugar Challenge Meal Plan to Start February Strong!